Recreated sound of Burning Pianos with strings artifacts. Perfect for cinematic music. We recorded six detuned pianos, then destroyed them with a crossbow, bow, ax and fire, resulting in an incredibly cinematic sound. As a result – integration of these impulses gives a special touch to the overall sound. Each instrument has been pre-recorded – to achieve clean detuned tone of each piano. Our goal was to record a clean sound impulses from crossbow bolts, arrows and air rifles. As a result – integration of these impulses gives a special touch to the overall sound. 6 Detuned Pianos / 17 presets. Size: 326 MB (535 MB uncompressed). 500 unique samples / 48 kHz 24-bits. NKS Support currently in development. Latest Full Kontakt 5 required. "Sampled in the perfect Kontakt 5 engine from Native Instruments – giving you a comfortable way to use the library in your compositions. Each instrument has been pre-recorded - to maintain it's absolutely detuned sound. Our goal was to achieve a clean sound impulses from crossbow bolts, arrows and air rifles." 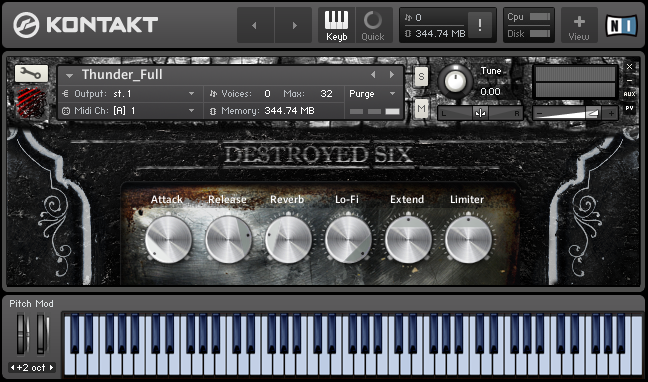 The unique sound of destruction and fire – is waiting for you in Destroyed Six.